Hypophthalmichthys nobilis és una espècie de peix de la família dels ciprínids i de l'ordre dels cipriniformes. Els mascles poden assolir 112 cm de longitud total i 21,3 kg de pes. És un peix d'aigua dolça i de clima temperat (4°C-26°C). Es troba a Àsia: la Xina, tot i que ha estat introduït a nombrosos països. Es comercialitza fresc i congelat. ↑ Bleeker P., 1859. Conspectus systematis Cyprinorum. Natuurkd. Tijdschr. Neder. Indië v. 20. 421-441. ↑ Richardson, J., 1845. Ichthyology.--Part 3. A: R. B. Hinds (ed.) The zoology of the voyage of H. M. S. Sulphur, under the command of Captain Sir Edward Belcher, R. N., C. B., F. R. G. S., etc., during the years 1836-1842, Núm. 10. Londres: Smith, Elder & Co. Ichthy. Voyage Sulphur 3: 99-150, Pls. 55-64. ↑ Li, S., L. Wu, J. Wang, Q. Chou i Y. Chen, 1990. Comprehensive genetic study on Chinese carps. Shanghai Scientific & Technical Publishers, Xangai, la Xina, 226 p.
↑ Hwang, H.C., P.C. Yueh i S.F. Yu, 1982. The freshwater fishes of China in colored illustrations. Vol. 1 Shanghai Sciences and Technology Press, Xangai, Xina. 173 p.
↑ Ang, K.J., R. Gopinath i T.E. Chua, 1989. The status of introduced fish species in Malaysia. p. 71-82. A: S.S. De Silva (ed.) Exotic aquatic organisms in Asia. Proceedings of the Workshop on Introduction of Exotic Aquatic Organisms in Asia. Asian Fish. Soc. Spec. Publ. 3, 154 p. Asian Fisheries Society, Manila, Filipines. ↑ Bartley, D.M., 1993. An application of international codes of practice on introductions of aquatic organisms: assessment of project on the use of Chinese carps in Mozambique. FAO Fish. Circ. 863. 21 p.
↑ Barua, S.P., M.M.H. Khan i A.H.M. Ali Reza, 2001. The status of alien invasive species in Bangladesh and their impact on the ecosystems. p. 1-7. A: P. Balakrishna (ed.) Report of Workshop on Alien Invasive species, GBF-SSEA. Colombo. IUCN Regional Biodiversity Programme, Asia, Colombo, Sri Lanka. ↑ Borbori, D.C., P.S. Economidis i E.G. Maurakis, 2001. Freshwater fish habitat science and management in Greece. Aquatic Ecosystem Health and Management 4: 381-391. ↑ Central Fisheries Department Pakistan, 1955. Marine fishes of Karachi and the coasts of Sind and Makran. Govt. of Pakistan Press, Karachi. ↑ Chiba, K., Y. Taki, K. Sakai i Y. Oozeki, 1989. Present status of aquatic organisms introduced into Japan. p. 63-70. A: S.S. De Silva (ed.) Exotic aquatic organisms in Asia. Proceedings of the Workshop on Introduction of Exotic Aquatic Organisms in Asia. Spec. Publ. Asian Fish. Soc. 3, 154 p.
↑ Chou, L.M. i T.J. Lam, 1989. Introduction of exotic aquatic species in Singapore. p. 91-97. A: S.S. De Silva (ed.) Exotic aquatic organisms in Asia. Proceedings of the Workshop on Introduction of Exotic Aquatic Organisms in Asia. Spec. Publ. Asian Fish. Soc.3, 154 p.
↑ Coad, B.W., 1996. Exotic fish species in the Tigris-Euphrates basin. Zoology in the Middle East 13:71-83. ↑ De Groot, S.J., 1985 Introductions of non-indigenous fish species for release and culture in the Netherlands. Aquaculture 46:237-257. ↑ De Iongh, H.H. i J.C.J. Van Zon, 1993. Assessment of impact of the introduction of exotic fish species in north-east Thailand. Aquacult. Fish. Manage. 24:279-289. ↑ Eidman, H.M., 1989. Exotic aquatic species introduction into Indonesia. p. 57-62. A: S.S. De Silva (ed.) Exotic aquatic organisms in Asia. Proceedings of the Workshop on Introduction of Exotic Aquatic Organisms in Asia. Asian Fish. Soc. Spec. Publ. 3, 154 p. Asian Fisheries Society, Manila, Filipines. ↑ Eldredge, L.G., 1994. Freshwater fishes. p. 73-84. A: L.G. Eldredge, Perspectives in aquatic exotic species management in the Pacific Islands. Vol. 1. Introductions of commercially significant aquatic organisms to the Pacific Islands. South Pacific Commission, Nova Caledònia. ↑ Golani, D. i D. Mires, 2000. Introduction of fishes to the freshwater system of Israel. Isr. J. Aquacult. / Bamidgeh 52(2):47-60. ↑ Jang, M.-H., J.-G. Kim, S.-B. Park, K.-S. Jeong, G.-I. Cho i G.-J. Joo, 2002. The current status of the distribution of introduced fish in large river systems of South Korea. Internat. Rev. Hydrobiol. 87(2-3): 319-328. ↑ Keith, P. i J. Allardi, 1998. The introduced freshwater fish of France: status, impacts and management. p. 153-166. A: I.G. Cowx (ed.) Stocking and introduction of fish. Fishing News Books. MPG Books Ltd., Bodmin, Cornualla. ↑ Kim, I.-S., 1997. Illustrated encyclopedia of fauna and flora of Korea. Vol. 37. Freshwater fishes. Ministry of Education.:1-629. ↑ Kottelat, M., 2001. Fishes of Laos. WHT Publications Ltd., Colombo 5, Sri Lanka. 198 p.
↑ Kottelat, M., A.J. Whitten, S.N. Kartikasari i S. Wirjoatmodjo, 1993. Freshwater fishes of Western Indonesia and Sulawesi. Periplus Editions, Hong Kong. 221 p.
↑ Lever, C., 1996. Naturalized fishes of the world. Academic Press, Califòrnia, Estats Units. 408 p.
↑ Li, S., B. Zhou i Q. Lin, 1990. The yield and growth of major fish species in a large Chinese reservoir. Asian Fish. Sci. 3(2):185-196. ↑ Lim, K.K.P. i P.K.L. Ng, 1990. The freshwater fishes of Singapore. Singapore Science Centre, Singapur. 160 p.
↑ Mirza, M.R., 2002. Checklist of freshwater fishes of Pakistan. Department of Zoology, Government College University, Lahore, Pakistan. ↑ Ojaveer, E. i E. Pihu, 2003. Estonian natural fish waters. p. 15-27. A: E. Ojaveer, E. Pihu and T. Saat (eds.) Fishes of Estonia. Estonian Academy Publishers, Tallinn. ↑ Petr, T., 1999. Coldwater fish and fisheries in Bhutan. p. 6-12. A: T. Petr (ed.) Fish and fisheries at higher altitudes: Asia. FAO Fish. Tech. Pap. Núm. 385. FAO, Roma. 304 p.
↑ Rixon, C.A.M., I.C. Duggan, N.M.N. Bergeron, A. Ricciardi i H.J. Macisaac, 2005. Invasion risks posed by the aquarium trade and live fish markets on the Laurentian Great Lakes. Biodivers. Conserv. 14:1365-1381. ↑ Shao, K.-T. i P.L. Lim, 1991. Fishes of freshwater and estuary. Encyclopedia of field guide in Taiwan. Recreation Press, Co., Ltd., Taipei. vol. 31. 240 p.
↑ Shetty, H.P.C., M.C. Nandeesha i A.G. Jhingran, 1989. Impact of exotic aquatic species in Indian waters. p. 45-55. A: S.S. De Silva (ed.) Exotic aquatic organisms in Asia. Proceedings of the Workshop on Introduction of Exotic Aquatic Organisms in Asia. Asian Fish. Soc. Spec. Publ. 3, 154 p.
↑ Vigliano, P.H. i G. Darrigran, 2002. Argentina's Freshwater Systems, Aliens in Wonderland p. 25-44. A: Proceedings of the 11th International Conference on Aquatic Invasive Species. ↑ Xie, Y., 2001. Invasive species in China - An overview. p. 20-46. A: P. Balakrishna (ed.). Report of Workshop on Alien Invasive Species, GBF-SSEA. Colombo. UICN Regional Biodiversity Programme, Asia, Colombo, Sri Lanka. ↑ Zan, R., Z. Song i W. Liu, 1986. Studies on karyotypes and DNA contents of some cyprinoid fishes, with notes on fish polyploids in China. A: T. Uyeno, R. Arai, T. Taniuchi i K. Matsuura (eds), Indo Pacific Fish Biology, Tòquio, Ichthyol. Soc. of Japan, p.877-885. Arthur, J.R. i S. Lumanlan-Mayo, 1997. Checklist of the parasites of fishes of the Philippines. FAO Fish. Tech. Pap. 369, 102 p. FAO, Roma. Baensch, H.A. i R. Riehl, 1991. Aquarien atlas. Bd. 3. Melle: Mergus, Verlag für Natur- und Heimtierkunde, Alemanya. 1104 p.
Bleeker, P., 1878: Sur les espèces du genre Hypophthalmichthys Blkr. (Cephalus Basil. nec. Bl. nec. Al.). Verslagen en Mededeelingen der Koninklijke Akademie van Wetenschappen. Afdeling Natuurkunde (Ser. 2) v. 12: 209-218. Boulenger, G. A., 1901: On the presence of a superbranchial organ in the cyprinoid fish Hypophthalmichthys. Annals and Magazine of Natural History (Series 7) v. 8 (núm. 45): 186-188. Brummett, R.E., R.O. Smitherman i R.A. Dunham, 1988. Isozyme expression in bighead carp, silver carp and their reciprocal hybrids. Aquaculture. 70:21-28. Cremer, M.C. i R.O. Smitherman, 1980. Food habits and growth of silver and bighead carp in cages and ponds. Aquaculture 20:57-64. Cui, J., Ren, X. i Yu, Q., 1991. Nuclear DNA content variation in fishes. Cytologia 56:425-429. Dealmeidatoledo, L.F., A.P.V. Bigoni, G. Bernardino i S. Detoledo, 1995. Chromosomal location of NORs and C bands in F1 hybrids of bighead carp and silver carp reared in Brazil. Aquaculture 135(4):277-284. Fermín, A.C. i D.M. Reyes, Jr., 1989. 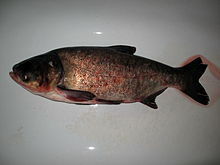 HCG and LHRH-A induced spawning in bighead carp Aristichthys nobilis Rich. reared in floating cages in Laguna de Bay. The Philippine Scientist, 26: 21-28. Frimodt, C., 1995. Multilingual illustrated guide to the world's commercial warmwater fish. Fishing News Books, Osney Mead, Oxford, Anglaterra. 215 p.
Howes, G. J., 1981: Anatomy and phylogeny of the Chinese major carps Ctenopharyngodon Steind., 1866 and Hypophthalmichthys Blkr., 1860. Bulletin of the British Museum (Natural History) Zoology v. 41 (núm. 1): 1-52. Jhingran, V.G. i R.S.V. Pullin, 1988. A hatchery manual for the common, Chinese and Indian major carps. ICLARM Stud. Rev. 11, 191 p.
Paperna, I., 1996. Parasites, infections and diseases of fishes in Africa. An update. CIFA Tech. Pap. Núm. 31. 220 p. FAO, Roma. Ren, X., J. Cui i Q. Yu, 1992. Chromosomal heterochromatin differentiation of cyprinid fishes. Genetica 87:47-51. La pàgina va ser modificada per darrera vegada el 17 ago 2018 a les 02:09.